Arby’s makes a delicious cherry turnovers recipe. This is one of the few fast food desserts that tastes like it comes from a nice bakery. With frozen puff pastry you can make this cherry turnover at home. Turnovers recipes often begin with puff pastry. You can make homemade puff pastry. It takes a long time to do, and the results are really good. In fact, if you want a recipe for homemade puff pastry. Martha Stewart has a really nice recipe for homemade puff pastry. If you are like many of us you make take a stroll down your frozen food section and grab some frozen puff pastry. I personally like Trader Joe’s Puff Pastry, Pepperidge Farm, or sometimes my local store will have another brand. Any of them will do. Now I suggest that you read the back of the box for their defrosting directions and follow them implicitly. I have ruined boxes of puff pastry by simply leaving them out on the counter for a long time. If you do this you may end up with a hunk of dough that is hard to use. I am using canned pie filling for this recipe. For this turnovers recipe I typically choose a better quality cherry pie filling. This is one of those times I typically bypass the store brand and go for one such as Solo, Musselman’s, or Comstock when making cherry turnovers. I think each one of these brands are quite good and can be used just fine. You will be amazed at how easy it is to make your own Arby’s Turnovers recipe at home. What I really like about their dessert is that it reminds me so much of the ones I had when I was growing up. I grew up in Pueblo, Colorado. About once ever two weeks we would go to King Soopers, which was our grocery store. They had an amazing bakery there, and we would get some turnovers every once in awhile. They were such a treat. Arby’s is the only place that I know that has something as similar to the ones I had growing up. I hope you enjoy these as much as I do. If you do not like cherries, you could make this with peach pie filing, blueberry pie filling, or even apple pie filling. 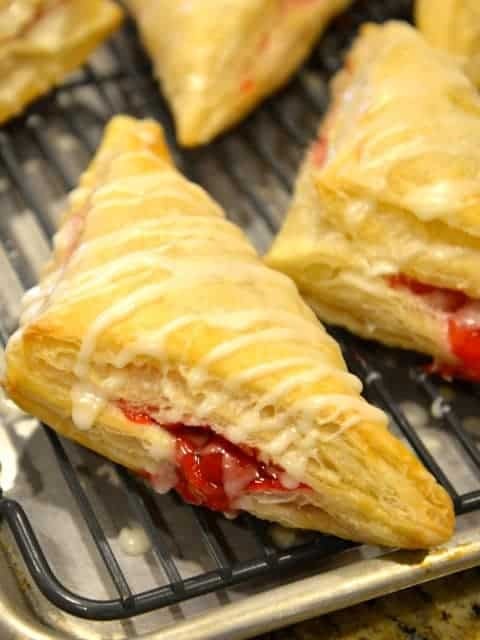 Make Arby's Cherry Turnovers at home with this copycat recipe. Preheat oven to 375 degrees. Kay out the puff pastry squares on an ungreased baking sheet. Cut puff pastry into 4 by 4-inch squares. Place about 2 tablespoons of pie filling into the center of each square. Ideally, there will be about 5 to 6 cherries in each turnover. Do not overfill too much as the filling may leak out while baking. Fold the turnover to make a triangle. "Glue" the triangle shut by brushing the egg wash on all the inside edges of the puff pastry but 1 inch in the center of each of the sides. This will allow the puff pastry to vent while cooking. Gently press the edges together, don't press the edges too hard, doing this will leave you with edges that won't puff as they should. Brush the top of the turnover with egg wash. Bake for 25 to 27 minutes, or until lightly browned. Remove from oven and allow to cool slightly. Make the icing by combining the milk and the powdered sugar in a small bowl. Drizzle frosting over the turnovers. Store in an airtight container. These are best eaten within 1 or 2 days. Suggest a drop of vanilla extract to “pop” the icing flavor up a notch. How About the Cracker Barrel campfire packets. Thank you, I’ve made some of these tonight, using Pepperidge Farms puff pastry sheets and Comstock. I brushed melted real butter and a bit of sugar over the tops of mine, and they browned nicely, and turned out grand! May I link to this blog page of yours, in my blog? Why does Arby’s have one rasient in each pastry? I never had that in any Arbys I have been to. Could you please help me with the recipe for puff pastry??? Could you please help me with the recipe of turnover puff pastry?? thanks Dorcas! I would like to have a recipe for California Dreaming Potato Soup…..a very good soup. I love all of your recipes!!!! Do you have a favorite fast food dessert? I just got paid —————————————————–.